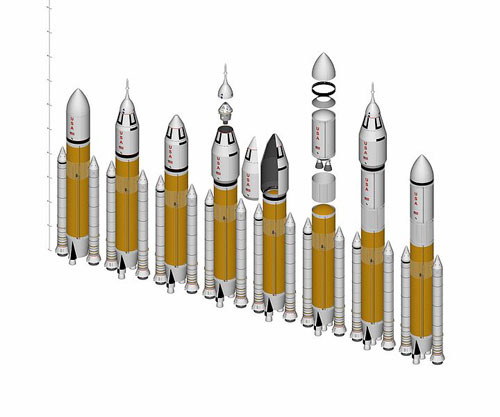 > The Direct movement – a group of professionals and non-professional engineers that created an architecture alternative to Constellation’s Ares vehicles – are ready to transition their movement, following the redirection of NASA’s future by lawmakers, which calls for a Space Launch System (SLS) based around a Shuttle Derived (SD) Heavy Lift Launch Vehicle (HLV), which they feel justifies their four years of work. Their work in promoting this idea has been impressive, given the criticism and outright scorn they received over the years. I’ve always eyed it a bit wearily. It sounds logical enough — all the elements are there in some form or another and most have been flown. But, that was the whole point behind Ares I and V. That didn’t work out very well, largely because adapting the technology cost as much or more than building something new from scratch. The DIRECT supporters say this design is different, but I’m not entirely convinced. My other main concern is operating costs with anything that is shuttle derived. The entire shuttle program has been a story of the cost of getting into orbit being so expensive that we’ve been limited in what we can do there. Thirty years and we’ve got one space station with six people on it. That had a lot to do with the cost of building, operating and maintaining the shuttle system, and the small army of people needed to do it. DIRECT will probably be a bit better in the sense that we’re not lugging any entire shuttle into orbit that has to be returned to Earth with the crew safely intact. But still, I wonder if this is the right way to go. And what NASA will recommend after it finishes the current study on HLV.